You can use templates to choose from a number of layouts and themes to assist in the creation of HTML pages. Templates provide report and chart frames, a form for controls, text boxes, and other objects arranged in a fixed layout that simplifies the design process. By using templates, styling is predefined for you so that you only have to provide information for the objects to create an HTML page that is ready to use. Controls cannot be added manually, they must come from parameters in the reports and charts. If you build a page using templates, you will not be able to freely arrange objects or add controls manually. Note: To create an HTML page without using templates, select Cancel from the Template Selector window. When you create a new HTML page, the Template selector opens and provides options for different layouts and themes, as shown in the following image. Displays options for tabbed and non-tabbed templates. Both tabbed and non-tabbed templates have the option of simple or advanced. Advanced templates contain elements for additional titles, hyperlinks, and descriptions. Simple templates contain less objects. Displays options for the layout part of the template. You can choose the number of reports or graphs for the HTML page to contain, as well as how those reports and graphs are laid out within the page. Sets the HTML page to Guided Report Mode. For more information on Guided Reports, see Creating Guided Report Forms. Sets the Template Selector to be turned off by default. If you select this check box, the Template selector will not appear the next time you create an HTML page. To reactivate the Template Selector, see How to Turn the Template Selector On. Report sets are containers on an HTML page designed in Template mode that hold a form and controls, reports, and the report set title. Adding a new report set to a page will add all of these elements to the page. Note: The form and controls will not display on the HTML page until they are needed. For example, if you import a report that contains variables, the form and controls will display. 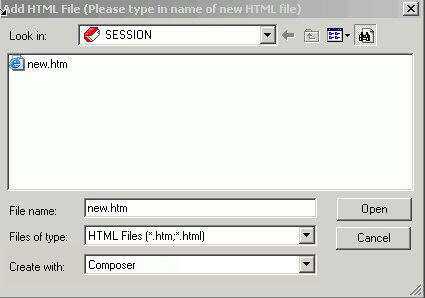 With the HTML folder highlighted, select New from the File menu, then select HTML file. Right-click the HTML folder and select New then Guided Report Form. Click Layout Reports and Graphs in the QuickLinks pane. Note: If Don't show again was checked the last time the Template selector was opened, HTML Composer will open, skipping the Template selector window. To access the Template selector again, see How to Turn the Template Selector On. From the Templates List Box, select Simple or Advanced from the Non-tabbed or Tabbed section. For more information on Tabbed and Non-tabbed templates, see Tabbed and Non-Tabbed Template Types. From the Layouts pane, select a layout for the HTML page. From the Themes pane, select a color scheme for the HTML page. If desired, select the Guided Report Mode check box to enter Guided Report mode when the HTML page is created. If you selected the option to create an HTML page in Guided Report mode, this check box will not be visible. For more information on Guided Report mode, see Creating Guided Report Forms. If desired, select the Don't show again check box to skip the Template Selector window the next time an HTML page is created. When you create an HTML page using a template, there are two template types to choose from. Both template types have the option of simple or advanced. Advanced templates contain elements for additional titles and descriptions. Simple templates contain less objects. Advanced templates also contain a Hyperlinks strip. The elements for titles and descriptions in advanced templates are text objects that you can double-click to enter edit mode and edit the text. Tabbed templates contain numbered tabs for each report set. Non-tabbed templates have no tabs. The title of each tab can be edited. The DOCUMENT object in HTML pages created with templates has the property Tabbed layout. If set to Yes, each report set will be converted to a tabbed layout. If set to No, tabs are removed from the layout. If you select the Don't show again check box on the Template selector window when you create an HTML page, the Template selector no longer appears when creating a new HTML page. The following procedure explains how to turn the Template selector on so that it shows up when creating a new HTML page. Select Options from the Window menu. The Developer Studio Options dialog box opens. Select the Show 'Template Selector' dialog check box from the HTML Page tab and click OK. The Template Selector window appears the next time you create a new HTML page. The following describes the functionality and restrictions associated with HTML pages created with templates. Unless otherwise noted, these descriptions do not apply to a template that has been unlocked. HTML pages created with a template cannot use RIA themes. HTML pages that are created with a template and are then unlocked will still not be able to use RIA themes. All elements on the page use relative positioning. Objects are able to flow to accommodate the size of the browser window at run time. When the browser window is made smaller, the objects stack and when the window is made bigger, the objects show in a line. Existing elements cannot be moved. You can resize elements from any area except for the top-left corner. Due to positioning properties, elements are anchored by their top-left corner. Restricting the movement and positioning results in certain properties being unavailable while designing from a template. For more information on restricted properties, see Properties Restricted By Templates. The Insert menu is limited to only CSS/Scripts and Report set. You can change the selected color scheme of the template by accessing the Theme property of the DOCUMENT object in the Properties window. The layout of the template cannot be changed. HTML pages that are created with a template and are then unlocked can use and change themes. Newly added objects use the theme colors. If you wish to use active controls, you must unlock the template. The property Number of columns is available for form objects on HTML pages designed with templates. The default is 4, but you can change the number of columns by using the Number of columns property from the Properties window. The form has a grid which controls the layout of the columns and the position of the objects on the form.